Go ahead, give it a try. Ask a doctor, a patient, or a researcher (if you know one) what fact they can say with 100% certainty about MS. People used to be pretty adamant that it’s an auto-immune disease. Not so fast. Now the MS Society is hedging those bets by saying, “Multiple sclerosis (MS) involves an immune-mediated process”, whatever that means. The speaker at a recent talk I attended referred to the diagnosis of MS as a “diagnosis of exclusion.” In other words, they don’t so much diagnose what it is as what it isn’t. Once every other possible cause of a patient’s symptoms is eliminated – stroke, lead poisoning, lyme disease, etc., etc. – we can safely (?) call it MS.
Then you move on to treatment, which is similarly hit-or-miss. Try this shot. Too bad – you’ve developed neutralizing anti-bodies. That could be a problem. (But it might not be.) We’d better go to a non-interferon drug. Oops, another lesion on the MRI (even though you’re feeling fine). How about this pill? Still having attacks? That infusion should help. Maybe. I’ve grown increasingly skeptical (which, in my case, is saying something) about our grasp on MS. That, of course, throws how we treat it into question for me. What follows is one source of my suspicions. Before it was discovered that scurvy was the result of a vitamin C deficiency – and even after that fact was indisputable – some doctors clung to the theory that it was caused by constipation. There was a belief at a time in the 19th century that up to 40% of deaths in US was the result of exposure to unwholesome air during sleep. One story told of a doctor who treated a woman’s vision problem with a hysterectomy. How about the idea that tightly laced undergarments increased susceptibility to tuberculosis? For how long did doctors routinely treat a wide variety of illnesses by bleeding their patients or subjecting them to leeches? Were these bad people? No, they were acting on their best hunches, fed heavily by personal and societal biases. MS has had its share of such nonsense. Until former Olympic skier Jimmy Heuga challenged his treatment, doctors told MS victims to rest and avoid all exertion. Today it’s fairly clear that the exact opposite is true. Exercise and movement are critical to slowing the effects of the disease. At least, I think it’s so. What if that’s still true? What if what we “know” is wrong? What if the real way to treat MS has nothing to do with the direction we’re heading? What if all the debilitating side-effects of the current set of DMD’s (Disease Modifying Drugs – its acronym is disturbingly close to WMD – weapons of mass destruction) is doing us more harm than good? Just asking, is all. What do I know? 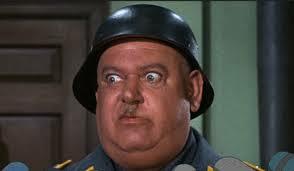 *Hogan’s Heroes. A great premise for a sitcom. Is anything funnier than a Nazi prison camp? This entry was posted in Books, MS and tagged bill bryson, cholera, diagnosis, dmd, drugs, hogan's heroes, jimmie heuga, medicine, mri, ms, sergeant schultz, side effects, treatment, tuberculosis. Bookmark the permalink. 5 Responses to I know nothing! HIlarious! Yes, everyone’s like, “duh, uh, hmmm, well uh.” So, ask me, ask me! I found the cause!!! I’m blogging about it to try to reach people and help some people heal. Lysolecithin is a demyelinating metabolite that is added to our products – mascara, lotion, weight training powders, DHA. It’s also unnaturally heightened in our foods through enzymes in our foods with lecithin – DiGiorno Pizza, Dunkin Donuts, fermented tofus (I think), Emeril’s pasta sauce. Go to my blog and find what’s causing your sclerosis. I’ll help you any way I can. Ask God if this is true. It’s not theory. So, what’s MS? It’s progressive paralysis caused by toxins in our food and products. Thanks God! This is an intriguing idea. While I’m not endorsing it, any new ideas are worth thinking about and researching. A quick Google search does show that lysolecithin is used in research to mimic MS’s demyelinating effects. It’s also true that we know very little about what all this crap added to our foods does to our bodies long term. You did more than most and Googled it. You get an A+. I have lists of foods and products with it in there.